The famous Al Roker with the Today Show loves his Hasty-Bake Charcoal Grill. 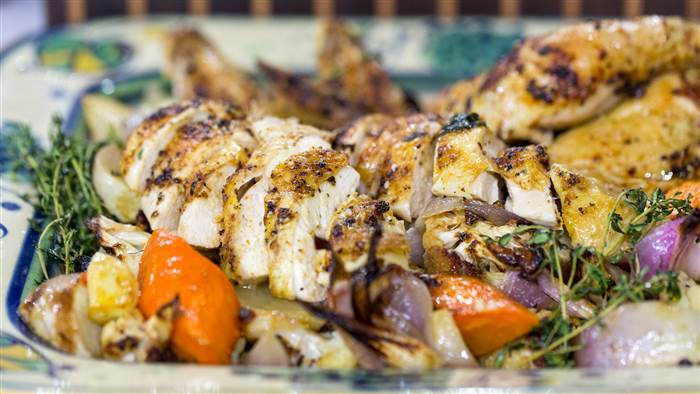 Al Roker features the one-pot beer can chicken recipe with savory vegetables using Hasty-Bake Gourmet Greek Seasoning on the Today Show! A handful of fresh herbs, such as thyme, sage, oregano, etc. 1.Fire up the Hasty-Bake Charcoal Grill to 375°F with Hardwood Lump Charcoal (half firebox) and a few chunks of apple wood only in one side of the firebox near the fire door. Once the grill is lit, raise the firebox to “Bake” and use heat deflector. 2. Rinse the chickens and pat dry. Apply some olive oil to the outside of each chicken. Sprinkle Hasty-Bake Gourmet Greek over entire chickens, including inside the cavities. 3. Open the beer cans and pour about 1/3 of each beer into a large roasting/dutch pan. Set the cans upright in the roasting pan. Lower a chicken onto one of the cans with the legs down, so that the can slides inside the cavity, leaving the chicken “sitting” on the upright can. Repeat with the other chicken and can. Position the chickens back-to-back in the center of the pan. 4. Place the vegetables in a large bowl, drizzle with olive oil, then season generously with salt and pepper and toss. 6. Add the garlic cloves and herbs and toss well. 7. Scatter the vegetables over the bottom of the pan around the chickens. 8. Place in oven and roast 1½ to 1¾ hours. Stir the vegetables every 30-40 minutes to distribute pan juices. 9. Remove from oven and let sit 15 minutes for the chicken juices to settle. 10. Spoon the vegetables onto a platter and tent with foil. Using tongs and a silicone hand mitt or thick kitchen towel, carefully lay the chickens on their backs in the pan and remove the cans, being careful about the hot beer that will pour out. 11. Lift the chickens out of the pan and onto a carving board. 12. Cut into pieces or carve the meat off the bone and place on top of vegetables. Instructions: 1.Fire up the Hasty-Bake Charcoal Grill to 375°F with Hardwood Lump Charcoal (half firebox) and a few chunks of apple wood only in one side of the firebox near the fire door. Once the grill is lit, raise the firebox to “Bake” and use heat deflector. 2. Rinse the chickens and pat dry. Apply some olive oil to the outside of each chicken. Sprinkle Hasty-Bake Gourmet Greek over entire chickens, including inside the cavities. 3. Open the beer cans and pour about 1/3 of each beer into a large roasting/dutch pan. Set the cans upright in the roasting pan. Lower a chicken onto one of the cans with the legs down, so that the can slides inside the cavity, leaving the chicken “sitting” on the upright can. Repeat with the other chicken and can. Position the chickens back-to-back in the center of the pan. 4. Place the vegetables in a large bowl, drizzle with olive oil, then season generously with salt and pepper and toss. 6. Add the garlic cloves and herbs and toss well. 7. Scatter the vegetables over the bottom of the pan around the chickens. 8. Place in oven and roast 1½ to 1¾ hours. Stir the vegetables every 30-40 minutes to distribute pan juices. 9. Remove from oven and let sit 15 minutes for the chicken juices to settle. 10. Spoon the vegetables onto a platter and tent with foil. Using tongs and a silicone hand mitt or thick kitchen towel, carefully lay the chickens on their backs in the pan and remove the cans, being careful about the hot beer that will pour out. 11. Lift the chickens out of the pan and onto a carving board. 12. Cut into pieces or carve the meat off the bone and place on top of vegetables. 13. Enjoy!